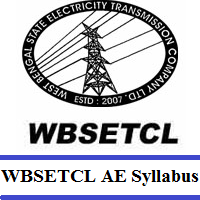 WBSETCL AE Syllabus 2019: The officials of the West Bengal State Electricity Transmission Company Limited (WBSETCL) decided to conduct the Assistant Engineer, Assistant Manager, Junior Executive Examination in the month of February 2019. So, for that purpose, all the applied candidates need to notify the exact wbsetcl.in Selection Process 2019 as well as the WBSETCL Exam Pattern 2019. We have also furnished you with the latest WBSETCL AE Exam Syllabus topics subject wise in the upcoming sections. Moreover, to score more in the पश्चिम बंगाल राज्य विद्युत प्रसारण कंपनी लिमिटेड test, you need to prepare by downloading the WBSETCL Assistant Engineer Syllabus 2019 PDF from the direct link at the end. This section illustrated all the detailed information about the WBSETCL Exam Pattern 2019. So, have a look over the tabular form as well as the minimum qualifying marks. Personal Interview will be conducted for 25 Marks. Negative marking: There will be no negative marking for wrong answers. Besides downloading the WBSETCL Assistant Engineer Syllabus 2019 PDF, you must once look at the below-listed topics that are to be covered before the examination. At the end of this page, we have inserted the appropriate link to download the WBSETCL AE Exam Syllabus PDF. So, by preparing with the WBSETCL AE Syllabus 2019, you can easily cover the important topics for the test. You can even get more information from our Freshers Now webpage. Subsequently, writing down the topics for the stipulated subjects enhances your performance level in the WBSETCL AE, JE, AM Written Exam 2019. Candidates who get shortlisted in the written test will have the chance to enter into the wbsetcl.in Selection Process. Immediately, note down the below-listed topics for each subject required for the test. Note the following topics required to prepare for the written examination.